Edgar John Fryer, known as Ted, was born in Frampton on Christmas Day 1898 to Albert Joseph Fryer, a haulier, and Flora Mary née Hitchings. In 1911, at the age of twelve, Ted was still attending school despite having been recorded absent several times during September and October 1910 while employed by his father to pick walnuts! 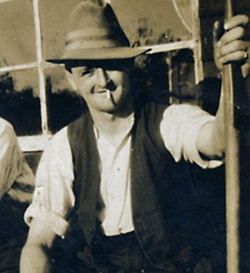 His older brothers Christopher Charles and Clevedon Wells, by then in employment, also served during the war. Ted later found work as a horse driver. Although he enlisted at Gloucester on 4 December 1916, Ted was immediately placed on the Army Reserve and was not mobilised until 28 March 1917. Owing to badly faded records it is unclear to which unit he was first assigned, but on 17 August it is probable that he was transferred to the 3rd (Reserve) Battalion of the Royal Warwickshire Regiment and served in France. He also appears to have served at times with both the 5th (Reserve) and 2/7th Battalions of his regiment. Ted's family say that he was gassed while serving. In August 1918 he became ill with diarrhoea, was sent back to the UK on 31 August, and by 9 September had been transferred to the 1st Southern General Hospital in Birmingham. While in the UK he must have recovered well enough to get into a little trouble; on 7 October Private Fryer overstayed sick leave (from a tattoo!) by a few hours, and on 11 November he similarly overstayed draft leave which suggests that on the day after the Armistice he may have been about to be posted back to France. His punishments were a fine of 8 days' pay and detention for 21 days respectively. Ted did not return to France and was discharged on 2 March 1919 after the standard 28 days leave. He was awarded the British War Medal and Victory Medal. His family still treasure the framed certificate given by the people of Frampton 'in recognition of his service during the Great War' and he is also commemorated on the plaque in the village hall. Ted married Rosamund Mary Weare in 1921 and they had six children: Joseph Walter Pierce, Charles Edgar John, Olive Edith Mary, James Albert (Jim), Clarence Edward (Chippy) and Dawn Marie. After the war Ted worked horse-drawn barges on the canal. He was also employed at Cadbury's making Bournvita, and then at Hoffmans in Stonehouse. Edgar John Fryer died on 13 April 1988 in Cashes Green Hospital, Stroud, and was buried in St Mary's churchyard.